Most athletes go their entire careers without ever appearing in Sports Illustrated. Jessie Sindlinger made her debut in the country's top sports magazine right out of high school. PHOTO: REGGIE MORROW Fresh off the pages of Sports Illustrated, Jessie Sindlinger hits the links for Iowa at Finkbine Golf Course. The UI freshman golfer was one of six amateur athletes nationwide featured in the "Faces in the Crowd" section of SI's July 29 issue. The weekly segment, which has featured famous golfers such as Jack Nicklaus, Tiger Woods, and Michelle Wie early in their careers, includes mug shots of up-and-coming athletes nominated by readers for the honor, along with a few sentences about their accomplishments. "I got a call from my high school golf coach who said I was nominated, so I ran around trying to find copies of the magazine," says Sindlinger. "I was so excited that I texted all my friends." Sindlinger earned the SI nod after her performance in this past spring's Iowa state high school golf tournament. She became only the second player in Iowa history—and the first in more than 50 years—to earn four-straight individual state titles when she finished the tournament eight strokes ahead of her nearest competitor. Sindlinger also led Charles City to its second team championship in three years—the only ones in school history. Sindlinger also lettered in basketball and took her volleyball team to a state title as a high school senior, but golf has been her life since she carded her first hole-in-one at age nine. While she's been showered with accolades (including 2010 Iowa Women's Golf Association Junior Player of the Year, 2012 Four State Junior Girls Golf Championship medalist, and 2013 National High School Coaches Association Senior Girls Golf Athlete of the Year), the honors student enjoys golf most for its mental focus and dual status as both an individual and a team sport. Representing her state this past summer at the PGA Junior Championship in Washington, D.C., Sindlinger received a glimpse of what she'll face in more intense Big Ten competition. She looks forward to using that competitive pressure this season to help improve her game. 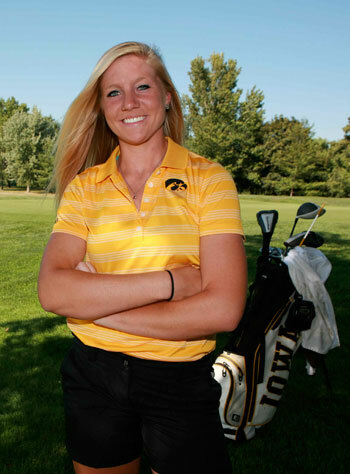 "[Jessie] understands how to win," says UI head women's golf coach Megan Menzel. "She has an amazing work ethic; when she puts her mind to something, it is going to get done."